I have travelled home last weekend to my parents, and I have planned a vegan deliciousness which is satisfying for even those (especially the guys) who consume meat in my family. After taking stock of the available ingredients at home, I have found mushrooms, salad, paprika, nuts, grains, and a pack of peas in the fridge. The result is today’s recipe which is easy to prep, decorative, and there’s no way of messin’ up! For the peas, put the peas in a large saucepan and cover with water, boil for 15-20 minutes. Add the salt, thyme, oil and pepper. Mix well. Add the mushrooms, pepper, nutmeg, thyme, and salt to taste. Fry for 3-4 minutes on a high heat. Reduce to a medium heat and cook for about 10 minutes. Reduce to a low heat and add the walnuts. Cook for a further 3-4 minutes. For the polenta, boil the water and salt in a large pan. Reduce to a low heat and add the maize (corn) grits, cook for 10 minutes, stirring constantly. Add the garlic and stir well. Remove from heat. 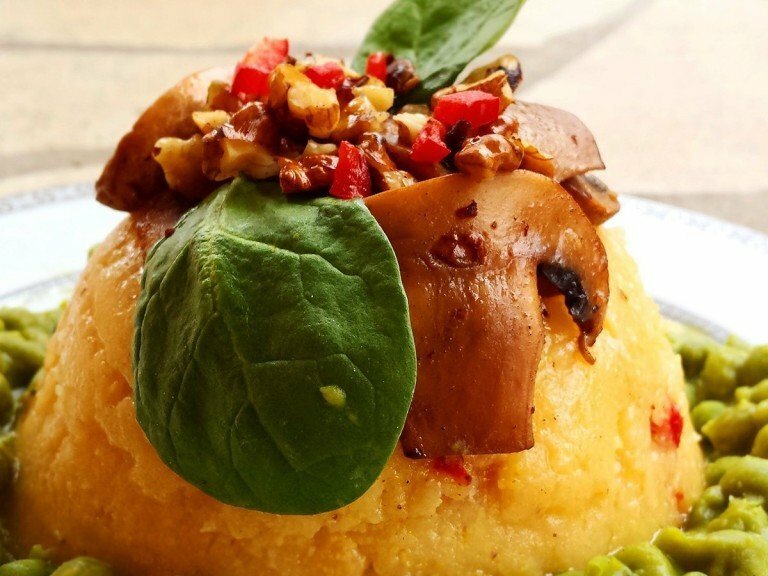 Fill a small bowl with the polenta. Let it rest for about 10 minutes to give the polenta time to take the shape of the bowl. Plate up the polenta by gently turning the bowl upside down. Be careful so the polenta keeps it’s shape! Top polenta with the mushrooms and peas, and serve. - Remember to watch your timing! You can make the mushroom mixture while the peas are boiling. - Be sure to lower the heat before adding the walnuts to the mushroom mix–burned vegetable oils can contain dangerous carcinogens! - Add the corn grits to the boiling water in small bits to avoid caking. - Grease the bowl with a tablespoon of olive oil before filling it with polenta. This makes it easier to remove the polenta once it’s set.